Over the last 3 years there has been many iPhone Killers. The first one was the LG Voyager. As the the Smartphone battle continues through the 2009 christmas season phone makers are uping the anti. All the major carriers are introducing new smartphones to compete with iPhone. 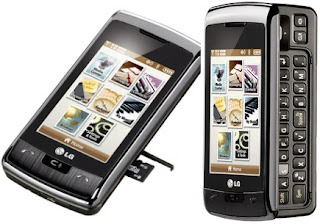 The LG enV Touch has taken Voyager phone to the next level. Inside the LG enV Touch is a full physical keyboard that many texters will prefer. The phone also has Bluetooth capability, built-in stereo speakers, a jack that supports a standard 3.5 millimeter headset plug, and a slot to accommodate a microSD card. Instead of swapping the card to a card reader, which generally also requires a converter, users can easly plug the enV TOUCH directlyinto a computer via the built in USB mass storage interface. This is especially useful as the phone also has built-in software that is capable of reading Microsoft Powerpoint, Excel and Word documents, as well as Adobe Acrobat .pdf files. The phone even comes with a few games like Tetris, Resident Evil, and Need for Speed. Its battery life is an exceptional 4.3 hours of talk time with 17 days standby.